Project of program on the manual operation of the models of the tractors of the family T -130 CHTZ.The scale of models 1:43, material metal, running of part- caterpillar setting, moving, all mechanisms of models are planned by workers. Y.Udarcev and GMM MINIGRAD Program of limited output of the models of the modifications of tractor T -100 in 2014. they let out the model of svaeboya SP-49 on the tractor T -100. The scale of model 1:43, material is metal, manual casting and manual soldering. In the construction of model is placed the functioning of all basic units of svaeboya in the working and march position. List of the models of the workshop Of yVS-Models of accessible to the order in 2013-2014, Prices they act beginning with 1.12.2013. GMM MINIGRAD within the framework of the program of output of the models of the modifications of the tractors Of kirovec http://www.minigrad-models.com/news.php?id=1005 N33 let out the model of the semitrailer tractor on the tractor K -701 with the semitrailer for dispersing the mineral fertilizers RUP-14. The scale of model 1:43, material is metal, manual casting and manual soldering, wheel rubber of the production of the specialized workshop from Kharkova. In the construction of model is placed the working and transport condition of the mechanisms of semitrailer, and also its separate installation on the telescopic supports. GMM MINIGRAD finished the development of base models T -140, T -180, D -804 within the framework of the program of output of the modifications of the models of the tractor T -180 BAZ, the first models of models will appear in November 2013. The scale of models 1:43, material metal, in the constructions of models it is placed completely working undercarriage, setting caterpillars, it is analogous with models DT-125, T -150. Y.Udarcev and GMM MINIGRAD in the addition of the program of output of the models of the modifications of tractor T -100 http://www.minigrad-models.com/news.php?id=1122 they let out the model of pipelayer T -1530 on the tractor T -100. 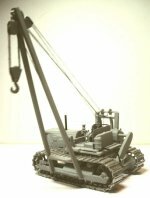 The scale of model 1:43, material metal, in the construction of model is provided motion and fixation in all operating positions of the actuating elements of the mechanism of pipelayer. Y.Udarcev and GMM Of minigrad in addition to to the program of output of the modifications of the models of tractor T -100 http://www.minigrad-models.com/news.php?id=1122 they let out the model of crane TK-53 on the tractor T -100. The scale of model 1:43, material metal, in the construction of model is provided motion and fixation in all operating positions of all elements of crane installation. Y.Udarcev and GMM MINIGRAD in addition to to the program of output of the modifications of the models of tractor T -100 http://www.minigrad-models.com/news.php?id=1122 they let out the model of tractor T -175. The scale of model 1:43, material metal, in the construction of model is placed motion and fixation in all operating positions of the blade of bulldozer. GMM Of minigrad, within the framework the program of output of the modifications of the models of the tractors Of kirovec http://www.minigrad-models.com/news.php?id=1005 ,it let out the final version of the model of welder AC -81 on the tractor K -701. The scale of model 1:43, material is metal and foundry plastic, wheel rubber, the production of the specialized workshop from Kharkova. In the construction of model the lift and the turnings of manipulator is provided. Workshop YVS-Models is planned to the removal from the production of models OKA and TOCHKA, in the flow October 2013 start the orders for the final production of these models, further forms on them will be destroyed, we request all those desiring to in proper time give the claims through our site or to our representatives in the regions. Y.Udarcev and GMM Of minigrad over the program of output of the models of the modifications of tractor T -100 http://www.minigrad-models.com/news.php?id=1122 they let out the model of reversable lift loader T -157 on the tractor T -108. The scale of model 1:43, material metal, manual casting and manual soldering, in the construction of model is provided displacement and fixation in all positions of the hoist of ladle. 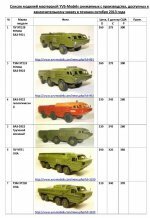 Workshop YVS-Models it brought the programs of the production of the models of the modifications of the automobiles Of moAZ http://www.yvs-models.com/news.php?id=972 let out the model of tank truck on the chassis Of moAZ-529. The scale of model 1:43, material resin, model of trailer- tank truck are executed completely by hand, without the application of forms. 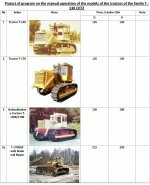 GMM Of minigrad within the framework of the program http://www.minigrad-models.com/news.php?id=1135 the productions of the models of the modifications of tractor T -150k let out model T -150k with the grader SD-105. The scale of model 1:43, material is metal, manual casting and manual soldering. In the construction of model the motion and the fixation of refuse in the different of position is provided, there is a possibility to remove grader. Y.Udarcev and GMM Minigrad let out the model of experimental automobiles MAZ-525D with the not on the staff scraper D -357 and MAZ-525 ballast pusher. The scale of models 1:43, material is metal, manual casting and manual soldering. 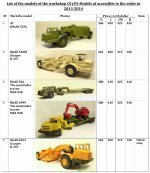 Y.Udarcev and GMM Of minigrad within the framework of the program http://www.minigrad-models.com/news.php?id=1122 the limited production of the models of the modifications of tractor T -100 they let out the model of snow-plough on the tractor T -108 of [poz].18. The scale of model 1:43, material is metal, manual casting and manual soldering. In the construction of model is provided the motion and fixation in the different positions all of actuating mechanisms. 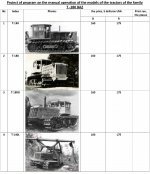 Y.Udarcev and GMM Of minigrad within the framework of the program of limited output of the models of the modifications of tractor T -100 http://www.minigrad-models.com/news.php?id=1122 they let out the model of crane MKT-6,3 (¹.17 of program). The scale of model 1:43, material is metal, casting and manual soldering. In the construction of model provided the motion of all basic elements of construction including ropes. Y.Udarcev and GMM Minigrad let out the test model of experimental evacuator on the chassis of automobile MAZ-525. The scale of model 1:43, material is metal, manual casting and manual soldering. Of information for the completely reliable means of model on the photo it proved to be not sufficiently, model was led according to the description of eyewitnesses. In the construction of model the functioning of all mechanisms is provided. In the nearest plans of workshop is MAZ-525 the scraper and MAZ-525 ballast tractor. GMM Minigrad let out the model of tractor DT-125 with the plow PN-5-35, the model of the plow of the work Of y.Udarceva. The scale of model 1:43, material is metal, casting and manual soldering. In the construction of model it is provided the lift of plow to the march position, lowering to is operating the position, fixation in all positions. GMM Minigrad let out the model of tractor T -150k with the plow PN-5-35, the model of the plow of the work Of y.Udarceva. The scale of model 1:43, material is metal, casting and manual soldering. In the construction of model it is provided the lift of plow to the march position, lowering to is operating the position, fixation in all positions.